Ensuring food security—the availability of basic staples at affordable prices—for a large and growing population has been one of India’s biggest economic and political challenges. Since the 1960s, policies have sought to balance producer and consumer welfare by focusing on increasing wheat and rice production, supporting prices, maintaining buffer stocks, and broadly distributing subsidized grain to consumers. With improved food grain supplies, the focus is now turning to reducing the high cost of public food grain management and improving the safety net for the poor. In addition, significant new challenges have emerged as rising incomes shift demand patterns in favor of high value foods such as fruit, vegetables, milk, meat, and eggs, and away from cereals. Diversification of agricultural production and marketing now offers the primary opportunity to strengthen lagging growth in farm output and rural employment. However, achieving diversified growth with equity also requires new measures to increase investment and provide the market institutions needed to develop India’s inefficient food processing and marketing sectors, and to ensure that the transformation to higher-value agriculture is inclusive of India’s large number of marginal and small farmers. By far the most striking transformation occurring in Indian agriculture is the shift from a food grain-oriented supply led framework dominated by the public sector, to a more diversified and demand driven framework with an expanding role for the private sector. Against this backdrop, we examine the emerging dynamics and challenges in India’s agricultural sector, including managing improvements in food access for the poor, facilitating a private sector led transformation to more efficient agricultural markets, and effectively linking small farmers to these increasingly diverse markets. Food Security: A Challenge Met? Despite marked improvement in food grain production since the 1960s, when India was heavily dependent on food aid, ensuring adequate domestic supplies and stable prices remain top priorities for Indian policymakers. Although India still periodically imports wheat, it is now a net food grain exporter that is typically among the top three world rice exporters and periodically a significant exporter of wheat and coarse grain. India’s improved domestic food grain supply situation is reinforced by a dramatic rise in foreign exchange reserves stemming from the increased competitiveness of its nonfarm exports since the early 1990s. 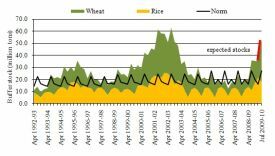 In contrast to the 1960s and 1970s when cereal import costs exceeded foreign exchange reserves (Ganesh-Kumar, Gulati, and Cummings, 2007), current (April 2009) reserves of about $250 billion now far exceed the cost of any plausible grain import requirement without disrupting other trade and capital account transactions. Despite the improvements in domestic supplies and commercial import capacity, events such as the 6.3 million tons of wheat imports required in 2006/07 and the global food price spike of 2007/08 continue to spark political pressure to continue to give food grain production top priority. The 2007/08 global price spike triggered a ban on rice exports to insulate domestic consumers from world prices, but added fuel to the rise in global rice prices. With the recent drop in prices for rice and other commodities, India is likely to resume rice exports. The efficient management of public procurement, handling, and storage of food grains by the Food Corporation of India (FCI), and effective targeting of consumer subsidies on low-income groups are continuing challenges in the food grain economy. Changes in weather and price policy have driven large swings in public procurement and stocks of wheat and rice since the early 1990s (Figure 1). Sharp hikes in minimum support prices led to the accumulation of large surpluses far in excess of targeted food security needs during the early 2000s—and now again in 2009/10—to be worked off through domestic and export subsidies, as well as storage losses. The real cost of public food grain management is growing about 9% annually, and now far exceeds annual public investment in agriculture [Landes, 2008]. Even with a vastly improved availability of food staples and burgeoning outlays on consumer subsidies, effectively targeting food subsidies on India’s large population of rural and urban poor remains a challenge. India’s national subsidized food distribution program was renamed the Targeted Public Distribution System (TPDS) in 1997/98, with a sharpened focus on targeting people living below the poverty line. Although subsidies have been increased for the poorest consumers, the TPDS is criticized for pilferage, poor delivery of services, and failure to make an effective dent in hunger, particularly in states where the concentration of poverty is the highest. The National Rural Employment Guarantee Scheme (NREGS), a large program introduced in 2006, aims to enhance livelihood security and household purchasing capacity by ensuring at least 100 days of wage work annually in rural areas. Local governance issues remain critical to the success of the NREGS and other efforts to target transfers to poor households. 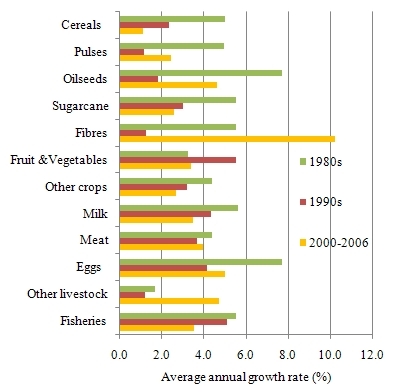 Indian farm output has been diversifying away from cereals and towards high value crop and livestock products since the early 1990s (Figure 2). The share of cereals in the total value of farm output has steadily declined, while growth in high-value products, including fruits and vegetables, sugar and fiber crops, milk, meat, and eggs, has significantly outpaced that of cereals. In recent years, India has emerged as the world’s largest producer of milk, the second largest producer of fruit and vegetables, and among the top producers of poultry meat and eggs. Increasingly, it is not just food grains that drive the agricultural sector and farm incomes, but growth in a broadening range of high value products. In contrast to cereals, where policy intervention has been extensive, the expansion of high-value crop and livestock agriculture has been led primarily by growth in consumer demand and changing preferences associated with rising incomes, urbanization, and youthful demographics. Although India’s climate, soil, and water resources provide the potential to diversify output, agricultural markets, market institutions, and processing industries needed to support diversification remain severely underdeveloped because of weak public and private investment. The agricultural marketing and processing sectors are characterized by a large number of small-scale, nonintegrated, and inefficient enterprises, and relatively few large vertically or horizontally integrated firms. Accelerating private investment in marketing and processing agribusiness requires overcoming a historically risky central and state government policy climate that heavily regulates movement, storage, and marketing of farm products, as well as poor power and transport infrastructure (Landes, 2008). Recent domestic and foreign private investment activity in marketing and processing, in part associated with regulatory reform by some states, may signal the emergence of a more dynamic agribusiness sector to support agricultural diversification. The rapid expansion of India’s poultry industry since the mid-1990s, driven by private investment in integrated operations that have significantly reduced the cost of producing and marketing poultry, is an example of the potential for private sector led growth (Landes, Persaud, and Dyck, 2004). Another is the expansion of private investment in milk processing and marketing after 2002, when regulatory reform allowed private firms to compete with the traditional dominance of dairy cooperatives. The market share of private players in the dairy sector is now expected to overtake the cooperatives by 2011 (Gupta, 2007). Since 2000, there has also been rapid growth in investment in modern food wholesaling and retailing by both domestic and foreign players. Food marketing in India has traditionally been dominated by small-scale independent wholesalers and retailers with little backward integration to farmers. Although the modern retailers still account for only about 1.5% of total food sales, and “back end” investment in supply chains remains limited, the expansion of modern retailing has the potential to spark investment in marketing efficiency and processing that yields benefits to both producers and consumers. The progress achieved in food security and agricultural diversification is promising for Indian agriculture, but perhaps the key challenge in achieving welfare gains lies in ensuring agricultural growth that is inclusive of small holders. It has been well documented that agricultural diversification generates greater employment opportunities, particularly for women, and higher incomes for farm households (Joshi, Birthal, and Minot, 2006). The area shift from cereals to vegetables, in particular, has enhanced employment opportunities in rural areas (Joshi, et al., 2005). However, the combination of a large number of small farmers, poor rural infrastructure, and fragmented and underdeveloped markets complicates establishment of efficient and equitable links between farmers and the diverse, emerging domestic market. Marginal and small farmers, whose average operational landholding declined from 2.2 hectares in 1970 to 1.06 hectares in 2003, continue to dominate India’s large agrarian economy. 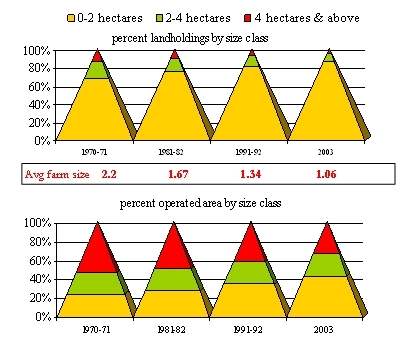 Nearly 88% of holdings are less than two hectares, with these holdings accounting for about 44% of the operated area (Figure 3). 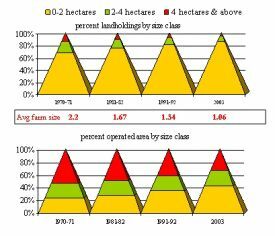 Fragmentation of operational holdings has expanded the bottom of the agrarian pyramid in all but a few Indian states. Small farms have proved to be more productive than large farms—they contribute about 51% of the value of farm output–owing to their intensive cultivation practices and abundance of family labor. In the case of fresh fruit and vegetables, survey results show that 52% of fruit area and 61% of vegetable area is cultivated by smallholders (Birthal, et al., 2006). But, significant progress needs to be made in developing efficient and equitable markets for large numbers of small surpluses of perishable goods, and in managing the limited risk bearing capacity of small farmers. India’s agricultural markets are crowded with middlemen and commission agents who receive high fees and margins that eat into the farmer’s incomes (Mattoo, Mishra, and Narain, 2007). Part of the problem lies in lack of adequate storage and transport infrastructure and integration between growers and markets which result in large postharvest losses. Because marketing regulations have historically prevented direct links between farmers and agribusinesses, a great deal needs to be done to build integrated processing and marketing firms, and to develop contract farming models and other market institutions to link small producers with markets. Small farmers primarily engaged in the traditional grain cultivation also typically lack incentives, capital, and expertise to venture into high value markets, and have limited ability to cope with the risks that may be associated with new enterprises. Although the potential gains from diversification are higher than for producing grains alone, measures are needed to mitigate potential price, production, and marketing risks. Indian agricultural policy must balance a changing food security landscape with the emerging need to diversify farms and markets towards high value commodities. On the food grain front, where the focus has been on increasing productivity, the current challenges are to reduce the cost and inefficiency of public food grain operations by the FCI, and to ensure an effective food safety net for low-income households. A key policy option is to shift responsibility for procuring, handling, and transporting operational supplies of wheat and rice to the private sector and confine the role of the FCI to holding buffer stocks (Srinivasan, Jha, and Landes, 2007). To improve the food safety net, current options include expansion of targeted rural employment and food distribution schemes such as the NREGS and school feeding programs, and the introduction of bio-metric identity cards to improve targeting the poor. Realizing the benefits from agricultural diversification implies significant challenges for agricultural price policy. The current price policy of favoring rice and wheat cultivation with support prices set on a cost-plus basis has become a politically important source of income support in grain surplus areas, but undercuts incentives to diversify even when diversified enterprises potentially yield more income per hectare. Lower relative support levels for food grains are necessary in order to allow market forces to play a larger role in resource allocation, but it is unclear how politically feasible this will be or if suitable compensating measures can be indentified. The most-discussed option has been to reduce the minimum support prices for grain, while purchasing all operational and buffer stocks required for subsidized distribution programs at prevailing market prices. In contrast to the dominant role played by the public sector in the development of India’s food grain sector, the process of diversification into high-value agriculture will largely depend on participation and investment by the private sector. The policy challenge is to shift from the role of dominant market player, to that of facilitator of private investment and efficient private markets. The pace of diversification is likely to hinge on an improved climate for private investment in agribusiness and infrastructure, including continued market-oriented reform of central and state level regulations that impede the emergence of modern, integrated marketing and processing firms. Meeting the challenge of fostering inclusive growth appears to be tied closely to easing restrictions on private sector participation in agricultural markets. Policymakers are increasingly focused on reforms that can help develop firm-farm linkages, including contract farming, cooperatives, and grower organizations. These activities have been restricted by state marketing regulations now being amended in some states to permit backward integration to the farm level by private agribusinesses. India’s poorly developed land rental markets are also a potential obstacle to firms and farms coming together to do business. Current laws do not adequately protect either party in land rental agreements, creating risks that minimize formation of larger operational holdings that might be more conducive to improving farm-firm linkages and on-farm investment. However, the politically sensitive legal reforms and costly improvements in land records needed to develop a more viable land rental market appear unlikely in the foreseeable future. Birthal, P.S., Joshi, P.K., Roy, D., and Thorat, A. (2006). Diversification in Indian Agriculture towards High Value Products: What determines it and who participates in it? In From Plate to Plough: Agricultural Diversification and its Implications for the Smallholders in India. Submitted to Ford Foundation, New Delhi, by International Food Policy Research Institute, Washington D.C.
Ganesh-Kumar, A., Gulati, A., and Cummings Jr., R. (2007). Foodgrains Policy and Management in India: Responding to Today’s Challenges and Opportunities. Unpublished manuscript. International Food Policy Research Institute. New Delhi Office. New Delhi. Gupta, P.R. (2007). Dairy India 2007. Dairy India Yearbook. New Delhi. Joshi, P.K., Birthal, P.S., and Minot, N. (2006). 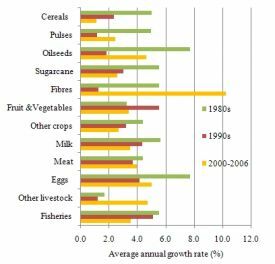 Sources of Agricultural Growth in India: Role of Diversification towards High-Value Crops. MTID Discussion Paper No. 98. International Food Policy Research Institute. Washington, DC. Joshi, P.K., Gulati, A., Birthal, P.S., and Tiwari, L. (2005). Agriculture Diversification in South Asia: Patterns, Determinants, and Policy Implications. InS.C. Babu and A.Gulati (Eds. ), Economic Reforms and Food Security. USA: The Haworth Press, Inc.
Mattoo, A., Mishra, D., and Narain, A. (2007). From Competition at Home to Competing Abroad: A Case Study of India’s Horticulture. New Delhi: The World Bank and Oxford University Press. Ashok Gulati (a.gulati@cgiar.org) is Director in Asia, International Food Policy Research Institute, New Delhi Office. Maurice R. Landes (mlandes@ers.usda.gov) is Senior Economist, USDA/ERS/MTED, Washington D.C. Kavery Ganguly (k.ganguly@cgiar.org) is Senior Research Analyst, International Food Policy Research Institute, New Delhi Office. The views expressed here by Maurice R Landes are those of this author, and may not be attributed to the Economic Research Service or the U.S. Department of Agriculture.